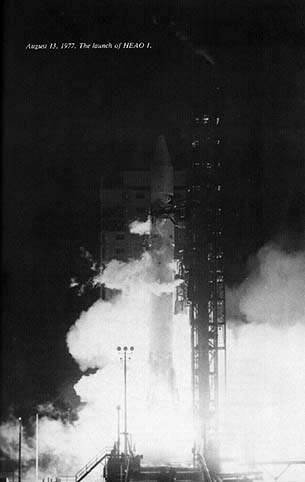 HEAO-1 was the first of three spacecraft in NASA's High Energy Astronomy Observatory program. It was designed to survey the entire sky for x-ray emission in the energy range from 0.1 keV to 10 MeV. The second HEAO mission, known as the Einstein satellite, carried the first focusing x-ray telescope, while the third HEAO was dedicated to cosmic ray research and also carried the first non-classified high resolution germanium solid state detectors to search for nuclear lines in the 20 keV to 10 MeV range. HEAO-1 carried four sets of instruments designated A-1 to A-4. The first three utilized gas proportional counters sensitive in the 0.1-60 keV range and used metal plates, tubes, or wires for collimation. The NRL Large Area Sky Survey instrument (A-1) was composed of 7 modules, each with area of 1600 cm2. Six modules were on one side and one was on the other with the rest of the instruments. The GSFC/CIT Cosmic X-Ray Experiment (A-2) consisted of six detectors optimized for three energy ranges: the Low Energy Detectors (LEDs), the Medium Energy Detectors (MEDs), and the High Energy Detectors (HEDs). Each had an effective area of about 800 cm2. The Harvard/MIT Scanning Modulation Collimator (A-3) was designed to provide accurate positions of strong sources using a wire grid collimator to a few tens of arcseconds. The UCSD/MIT HighEnergy X-ray and Low Energy Gamma-Ray instrument (A-4) used inorganic scintillators of NaI and CsI for detection of higher energy radiation up to 10 MeV. 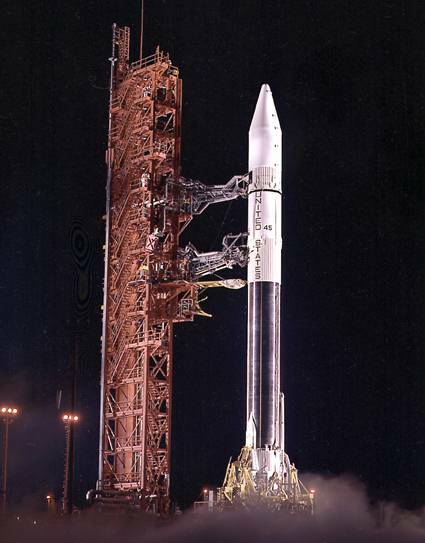 HEAO-1 was launched on August 12, 1977 from Cape Canaveral, Florida on an Atlas-Centaur into a circular orbit 420 km high and with an inclination of 23o to the equator, and with a period of about 93 minutes. It operated normally until January 9, 1979, when the hydrazine fuel used for attitude control ran out. The satellite re-entered the atmosphere on March 12, 1979. F.K. Knight, 1981, UCSD, "X-ray and Gamma-Ray Observations of Pulsed Emission from Radio Pulsars" P.L. Nolan, 1982, UCSD, "Hard X-ray Emission from Galactic Black Hole Candidates" F.L. Lang, 1985, MIT, "The Long Term Intensity Variations of Selected Celestial X-Ray Sources in the Energy range ~13-150 keV" G.V. Jung, 1986, UCSD, "The Hard X-ray to Low Energy Gamma-Ray Spectrum of the Crab Nebula" G.J. Hueter, 1987, UCSD, "HEAO-1 Observations of Gamma-Ray Bursts" Y. Soong, 1988, UCSD, "A Study of Temporal-Spectral Behavior of Hercules X-1"
Links to partners, groups, and other space science-related websites.